There are many theorems that you have to get fairly far into mathematics to even hear of. Often they involve things that are so abstract and abstruse that it’s hard to parse just what we’re studying. This week’s entry is not one of them. 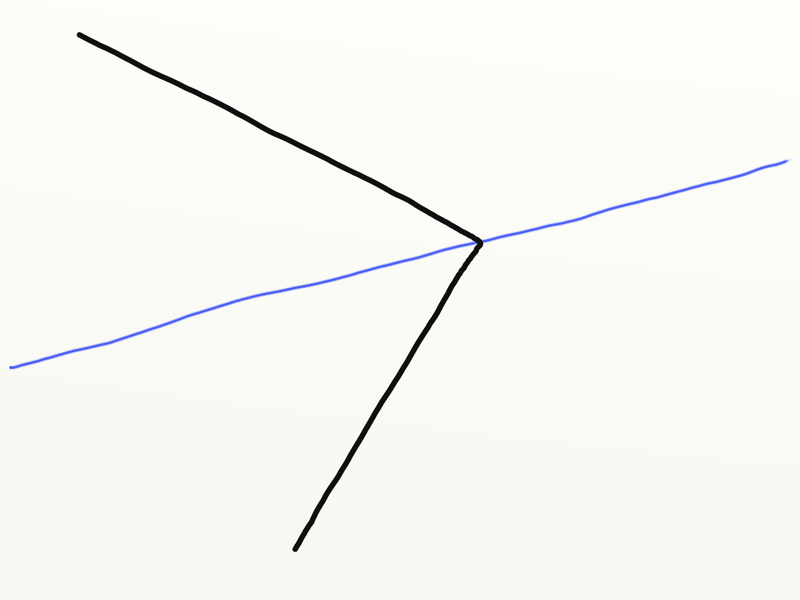 A simple closed curve in the plane divides that plane into exactly two domains, an inside and an outside. It’s named for Camille Jordan, a French mathematician who lived from 1838 to 1922, and who’s renowned for work in group theory and topology. It’s a different Jordan from the one named in Gauss-Jordan Elimination, which is a matrix thing that’s important but tedious. It’s also a different Jordan from Jordan Algebras, which I remember hearing about somewhere. The Jordan Curve Theorem is proved by reading its proposition and then saying, “Duh”. This is compelling, although it lacks rigor. It’s obvious if your curve is a circle, or a slightly squished circle, or a rectangle or something like that. It’s less obvious if your curve is a complicated labyrinth-type shape. 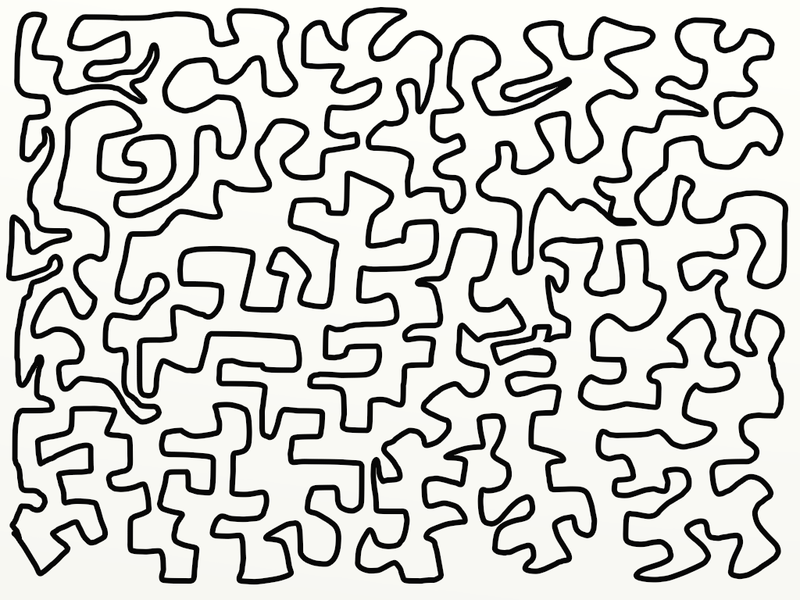 A generic complicated maze shape. Can you pick out which part is the inside and which the outside? Pretend you don’t notice that little peninsula thing in the upper right corner. I didn’t mean the line to overlap itself but I was using too thick a brush in ArtRage and didn’t notice before I’d exported the image. It gets downright hard if the curve has a lot of corners. This is why a completely satisfying rigorous proof took decades to find. There are curves that are nowhere differentiable, that are nothing but corners, and those are hard to deal with. If you think there’s no such thing, then remember the Koch Snowflake. That’s that triangle sticking up from the middle of a straight line, that itself has triangles sticking up in the middle of its straight lines, and littler triangles still sticking up from the straight lines. Carry that on forever and you have a shape that’s continuous but always changing direction, and this is hard to deal with. Still, you can have a good bit of fun drawing a complicated figure, then picking a point and trying to work out whether it’s inside or outside the curve. The challenging way to do that is to view your figure as a maze and look for a path leading outside. The easy way is to draw a new line. I recommend doing that in a different color. In particular, draw a line from your target point to the outside. Some definitely outside point. 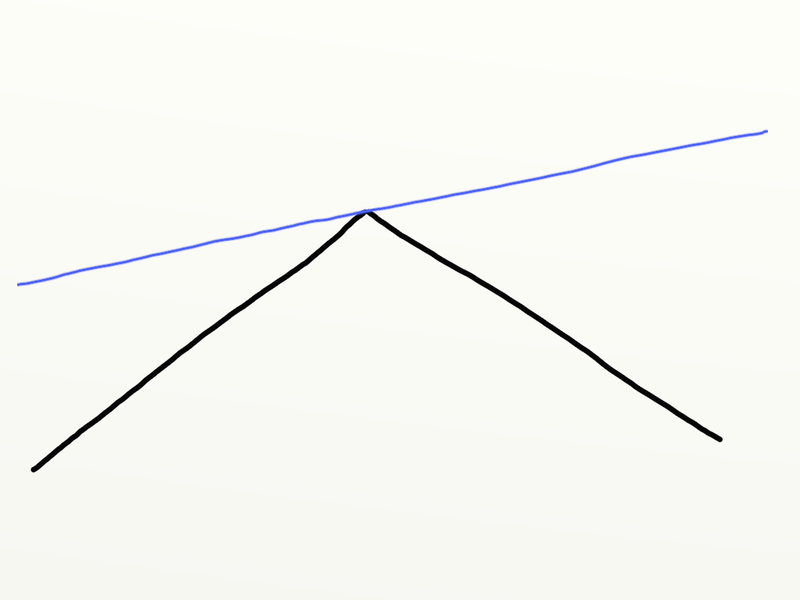 You need the line to not be parallel to any of the curve’s line segments. And it’s easier if you don’t happen to intersect any vertices, but if you must, we’ll deal with that two paragraphs down. 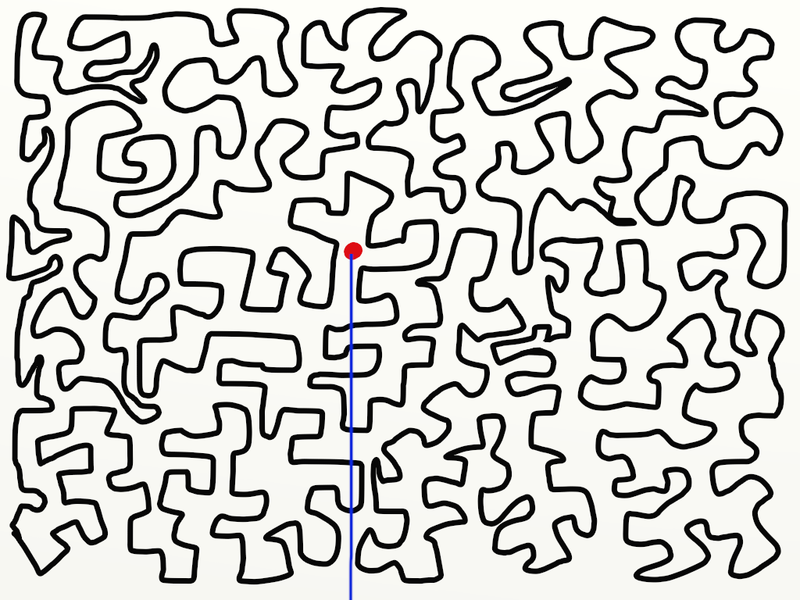 A red dot that turns out to be outside the labyrinth, based on the number of times the testing line, in blue, crosses the curve. I learned doing this that I should have drawn the dot and blue line first and then fit a curve around it so I wouldn’t have to work so hard to find one lousy point and line segment that didn’t have some problems. So draw your testing line here from the point to something definitely outside. And count how many times your testing line crosses the original curve. If the testing line crosses the original curve an even number of times then the original point was outside the curve. If the testing line crosses the original an odd number of times then the original point was inside of the curve. Done. If your testing line touches a vertex, well, then it gets fussy. It depends whether the two edges of the curve that go into that vertex stay on the same side as your testing line. If the original curve’s edges stay on the same side of your testing line, then don’t count that as a crossing. If the edges go on opposite sides of the testing line, then that does count as one crossing. With that in mind, carry on like you did before. An even number of crossings means your point was outside. An odd number of crossings means your point was inside. This? Doesn’t count as the blue testing line crossing the black curve. This? This counts as the blue testing line crossing the black curve. So go ahead and do this a couple times with a few labyrinths and sample points. It’s fun and elevates your doodling to the heights of 19th-century mathematics. Also once you’ve done that a couple times you’ve proved the Jordan curve theorem. Well, no, not quite. But you are most of the way to proving it for a special case. If the curve is a polygon, a shape made up of a finite number of line segments, then you’ve got almost all the proof done. You have to finish it off by choosing a ray, a direction, that isn’t parallel to any of the polygon’s line segments. (This is one reason this method only works for polygons, and fails for stuff like the Koch Snowflake. It also doesn’t work well with space-filling curves, which are things that exist. Yes, those are what they sound like: lines that squiggle around so much they fill up area. Some can fill volume. I swear. It’s fractal stuff.) Imagine all the lines that are parallel to that ray. There’s definitely some point along that line that’s outside the curve. You’ll need that for reference. Classify all the points on that line by whether there’s an even or an odd number of crossings between a starting point and your reference definitely-outside point. Keep doing that for all these many parallel lines. And that’s it. The mess of points that have an odd number of intersections are the inside. The mess of points that have an even number of intersections are the outside. You won’t be surprised to know there’s versions of the Jordan curve theorem for solid objects in three-dimensional space. And for hyperdimensional spaces too. You can always work out an inside and an outside, as long as space isn’t being all weird. But it might sound like it’s not much of a theorem. So you can work out an inside and an outside; so what? But it’s one of those great utility theorems. It pops in to places, the perfect tool for a problem you were just starting to notice existed. If I can get my rhetoric organized I hope to show that off next week, when I figure to do the Five-Color Map Theorem. Richard Courant and Herbert Robbins: What Is Mathematics?. My bedside book, since 1961. I’d first read it as an undergraduate and it was one of my first online book purchases. I do keep dipping into it and finding things I feel like I should write about here. But then I have to think of something to add to it. In my case, that’s jokes, mostly. Very interesting. Jordan Curve Theorem shows the rigor of math in action. I like it for being the sort of theorem that seems too obvious to be useful. I have got it scheduled to be used in next Thursday’s post. “You won’t be surprised to know there’s versions of the Jordan curve theorem for solid objects in three-dimensional space.” Not that I ought to doubt this, but the counterintuitive discovery that the 3-sphere can be everted sprang to mind, and now I’m worried. It’s a good worry and I’ll admit this is getting deeper into topology than I’m trained in. My suspicion is that the possible self-intersections of a sphere being turned inside-out cause it to fall outside the bounds of the Jordan-Brouwer Separation Theorem. I don’t have a good argument that has to be the case though; that’s just where I would start looking.